My fee for a 50-minute counseling session is $110. I occasionally have sliding scale slots ($60/session) available for those with limited access to resources. I am not able to take pro bono work at this time. I do not accept insurance. Many insurance companies offer “out of network” benefits, and I may be able to reimburse you for your sessions with me. If you’re interested in this, call your insurance company and ask them whether that’s possible and how much your plan will cover for an out of network mental health provider. Some people are able to use their health savings accounts to pay for counseling. If you have this benefit, call your HSA and ask if you’re eligible to use your HSA account to pay for out of network counseling and, if so, if you can use your HSA card for payment or if you can pay out of pocket and be reimbursed after the fact. Finding a therapist who’s a good fit for you is important. I offer a free, face-to-face, thirty minute consultation for all new clients. To schedule an appointment, fill out this contact form. I’ll reply within 48 hours. *Sometimes you need a specific kind of help, and you need it right away. Click here for a list of resources that may help you find the right resource for right now. 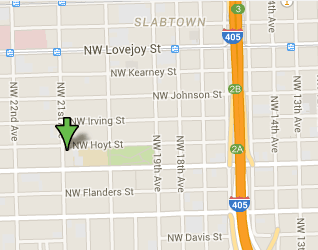 My office is located at 526 NW 21st Ave, at the corner of NW Hoyt & 21st. Across Hoyt there is a convenience store; one block further down 21st there’s a Coffee Time; one block east of my office sits Couch Park. The office entrance is marked by a vintage wrought iron door next to a large purple “Wise Counsel & Comfort” sign. Parking in the Alphabet District can be tricky. Some nights there will be ample street parking, and other nights it’ll be necessary to drive around for several frustrating minutes before finding a spot. Bus line 77 and Providence Park’s MAX stop may offer convenient alternatives to driving. Check Trimet’s trip planning website if you’re so inclined. When you arrive, please take a seat in the waiting room. Help yourself to some complimentary tea, and I will be with you shortly. Before or during our first session (after meeting for a free consultation), I’ll need to collect intake paperwork from you.